Fifteen articles in this collection document significant events in Carl Fisher’s life. His “palimony” suit with Gertrude Hassler is an interesting example. Another important point is the Zanesville, Ohio county fair horse track accident in September 1903 that involved his teammate Earl Kiser and resulted in the death of several spectators. Also, there is Carl’s wonderful first hand account of his balloon ride when he competed in the Speedway’s first competition – the national balloon championships of June 1909. This is a copy of an original letter dated May 1, 1939 and written by Harry D. Hartley of 4051 Washington Boulevard, Indianapolis. This gentleman was researching the location of three antique stop watches imported from Switzerland by Carl Fisher, Frank Wheeler and a Milton O. Reeves. The letter is a curiosity in that I question its factual accuracy. Among its claims is that Fisher, Wheeler and Reeves staged an auto race on an Indiana horse track in 1894 as a benefit to a Mrs. Webb, the caregiver for a group of orphaned children. Perhap's Carl Fisher's most dramatic and brilliant promotional stunt (pulled off with the assistance of his ballooning mentor, George L. Bumbaugh), this article (see attachment FisherStunt103108) covers his balloon flight over Indianapolis. This article reports the results of a 1904 race meet at the Indiana State Fairgrounds in which Carl Fisher competed with his new Mohawk racer. Mohawk was an early motor manufacturing company in Indianapolis. Fisher won a best of three heats match race against his friend and sometimes partner, Earl Kiser. The feature article of this file is a short piece describing the two Mohawk Cycle & Automobile Company racers that were ordered by Carl Fisher and Earl Kiser in 1903. Also appearing on the page is the description of track racing event. My original comments about these articles appear below in italics. Research by Dr. Elsa Nystrom has forced me to reconsider my views on the September 9, 1903, Zanesville accident involving Carl Fisher. When I researched the incident four years ago, I found evidence (in the form of articles attached here) that despite what was reported in the biographies about Carl Fisher, it was Earl Kiser at the wheel of the Mohawk racer that plunged into a group of spectators. This article provides insight to Carl Fisher's personality and private life. When Fisher married Jane Watts in 1909 it apparently came as a surprise to long time girlfriend Gertrude Hassler, a beautiful opera singer. Long before "palimony" became a part of our lexicon, Ms. Hassler obtained the legal counsel to file a $500,00 suit against Fisher in 1912. The Fisher Palimony trial dragged on for months. This article details some of the finer points of testimony, focusing particularly on the comments of Jane Watts Fisher, who disputed rival Gertrude Hassler's claim that Carl Fisher spent the Tuesday evening prior to his marriage ceremony with her. Also, there are good insights to the Fisher's "honeymoon," where Carl took Jane on a train trip to Los Angeles so he could testify in another court case, this one brought against his Prest-O-Lite Company due to another of its damaging and notorious factory explosions. This is another article that provides insights to the personal side of Carl Fisher. Written by Betty Blythe, the first woman to tour the Indianapolis Motor Speedway (in 1909 she rode with driver "Wild" Bob Burman at racing speed and lived to write about it) this story describes Carl and Jane Fisher's estate - called "Blossom Heath" - on Cold Spring Roads in Indianapolis. This article is an artifact of limited value. 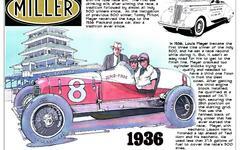 It is a story about the Premier Motor Car Company racer Carl Fisher commissioned for the 1905 Vanderbilt Cup. Just 26 months before Carl Fisher's death in July 1939, he drafted a letter to an open letter to Indianapolis News sports editor Ray Thompson which was published May 29, 1937. This is a good read for insights to the Indianapolis Motor Speedway founder and first president as he reflected on his life.